Her passion for science was augmented by a fervent commitment to social justice. While a student at Berkeley in the ’60s, she became fully engaged in the Civil Rights Movement, leading to a lifelong fight against injustice, racial discrimination and intolerance. She instilled these values in her daughters, who in turn have dedicated their lives to the pursuit of justice and equality – one as the first female elected District Attorney of SF and the other as vice president of Peace and Social Justice at the Ford Foundation in NY. Wilmott considers a “natural born Citizen” to be an individual born to two U.S.-citizen parents subject to the jurisdiction of the United States. He openly admits that his own birth in the United Kingdom to then-British-citizen parents disqualifies him from that subset of Americans. During our interview, Wilmott told us that at the end of last year, local “scuttlebutt” had it that Harris was eyeing a 2020 presidential run, prompting him to research her constitutional eligibility. Further supporting speculation that Harris will declare herself a 2020 presidential candidate are numerous articles dating to just after the 2016 presidential election. An August 15, 2018, an opinion column in the Long Beach Press-Telegram contended that “the betting website Oddshark just published brand new odds for the 2020 presidential race — and for the first time California’s junior U.S. Sen. Kamala Harris has tied Vermont Sen. Bernie Sanders as the betting favorite among potential Democratic candidates to win the election.” At the same time, the writer believes “that the soft-on-crime policies that Harris helped pass while serving as the district attorney of San Francisco and California attorney general directly contributed to the complete breakdown of one of America’s most beautiful cities,” referring to San Francisco. The writer’s views on Harris’s approach to prosecutions appear to be supported by statistics cited by Wikipedia. Since early this year, a myriad of mainstream reports have cited San Francisco’s growing sanitation crisis powered by homelessness and rampant drug use, with discarded hypodermic needles and tent cities a common sight in some areas. Some have compared the situation there to that of a “third-world” country for various reasons. An August 8, 2018 editorial cited the same statistics source at SFGate favoring Harris as a Democrat presidential contender. Harris served as City and County of San Francisco District Attorney from 2003 to 2010, when she was elected California Attorney General. She served one term, was re-elected in 2014, but in January 2015 announced her intention to seek the U.S. Senate to be vacated by the retiring Barbara Boxer. Kamala Harris has been considered a top contender for the 2020 Democratic nomination for President. She has publicly stated that she is “not ruling it out”. Her spending on Facebook advertising is unusually high, and targeted to reach voters outside California.. In July 2018, it was announced that she would publish a memoir, another sign of a possible run. On August 10, 2018, a letter to the editor in The Los Angeles Times opined that “Kamala Harris is a lot more qualified to be president than Donald Trump.” The article did not raise the constitutional eligibility issue. Wilmott’s December 4, 2017 letter to Harris references questions surrounding Barack Obama’s eligibility given that no verifiable proof of his alleged birth in the U.S. exists and he claims a father who was never a U.S. citizen. As the result of a five-year criminal investigation, the “long-form” birth certificate image posted at the White House website in 2011 bearing Obama’s name was declared a “computer-generated forgery” in March 2012. He reported that his letter received no response. The 12th Amendment states that the vice president must possess the same qualifications as the president. “It says nothing about what I asked her,” Wilmott observed. “I never heard from him,” Wilmott said. Editor’s Note: This article originally misstated the 25th Amendment as requiring the vice president to possess the same qualifications at the president when it is, in fact, the 12th Amendment which contains that language. 51 Responses to "Is Kamala Harris Eligible to be President?" She is as INELIGIBLE as obama was – INELIGIBLE, Neither one is a “Natural Born Citizen” This requires BOTH parents to be citizens and BORN on U.S. soil PERIOD!. Racism, the lying media and millions in fraudulent donations got the userper elected. I predict that in the last two years of the Trump administrations 8 years, the TRUTH about obama’s birth will be clearly displayed to all. This will void Sotomayor and Kegan appointments, giving two more conservatives to the Supreme Court. And another thing, while the English translation of the “Laws of the Nations” is correct, it is seldom read correctly. The author(s) put a comma after the word “natives”. This means the author(s) were not sure the term they used “natives,” sufficiently conveyed their true intent, so they placed a comma after “natives,” and went on to tell us what they actually meant by the word “natural born citizen”. It’s the difference between a defined clause and an undefined clause, grammatically speaking. Please, it’s time to move on. Think, why is it necessay for both parents to be U.S. citizens in order to be Art. II, § I, Cl. 5 natural born citizens? Exclusivity of allegiance at birth. It doesn’t get any more complicated than that. The only real question is, in a constitutional Republic, does the state bestow natural born citizenship on the child via the 14th Amendment, or do its parents’ (being sovereigns) transfer their pledge to support and abide by the U.S. Constitution to their offspring until the age of majority? As far as John McCain goes, it would all depend on whether or not he was issued a Panamian birth certificate at birth. If he was, he was not an nbC, which seems the case. If he wasn’t, he would be an nbC. Tom Polhaus, Thomas Woodrow Wilson was born in 1856 to Joseph Wilson and Jesse Woodrow. Joe and Jesse were married in 1849. The “legal doctrine of coverture” [cited below by Gary M. Wilmott] made Jesse a US Citizen upon marrying Joseph Wilson, a US Citizen, seven years before T.W.Wilson was born IN the US. T.W.Wilson was an NBC. Jigsaw John, George M. Dallas’ Mother Arabella Maria Smith was born in Devon, England and was the daughter of Major George Smith of the BRITISH Army. She was a Brit when she was married to George’s father Alexander Dallas. Alexander was born in Kingston, Jamaica. I doubt that George Dallas’s Mother Arabella subscribed to the cause of the American Revolution and the War of 1812 and therefore could NOT be a US Citizen given her loyalty to the Crown,as the daughter of a British Army Major. In any event, my research was a cursory review. One would have to delve further into specifics for more precise details. In any event the only two Usurper Presidents were Obama and Arthur. Both born with dual British US Citizenship. The fact that the US was fighting a war of independence FROM England made british subjects who were loyal to the crown, most unacceptable as OUR President or VP. His mother, Jessie Janet Woodrow, was born in Carlisle, England. Any proof she naturalized before his birth? Why not? Born in Philadelphia in 1792, father was citizen (naturalized “six or seven” years before the Constitution was ratified. Mothers status unknown but wouldn’t she be a citizen from here marriage? Seems to meet your definition. Jonathan David Mooers, The first 7 presidents and VPs were grandfathered in. Martin Van Buren was our first NBC President. George Dallas, VP to President Polk was not an NBC. Neither was Chester Arthur, VP to President Garfield. Arthur was a usurper “President”. Charles Curtis, VP to Herbert Hoover was born in the Kansas Territory to a US Citizen Father and a Native American Mother in 1860. Hubert Humphrey, VP to President Johnson was born in the US to a US Citizen Father and a Norwegian Mother (who may or not have been naturalized) at the time of Hubert’s birth. Spiro Agnew’s father was born in Greece. Spiro was born in 1918 and was VP to Richard Nixon. Walter Mondale, VP to Jimmy Carter was the son of a US Citizen Father and a Canadian Mother. VP Cheney is related to both Harry Truman and our second usurper “President” Barack Obama. A point or two to ponder. Both Demorats and Republican’ts supported / co-signed on voiding NBC. performing active service in the U.S. Armed Forces. I’m not fully sold on this one. CDR and others, indeed respond with input. 1. What reasoning and discussions lead to the last mandate/sentence of The 12th Amendment, being, “…But no person constitutionally ineligible to the office of President shall be eligible to that of Vice-President of the United States.” ? I surmise, our immigration system is not broken, it is disobeyed by the US Government. Same with CITIZENSHIP BORDERS; and only private sector “P&E graduates”, along with President Trump, can enforce “natural born Citizen” as being, in its simplest foundational uncontestable form, BORN WITHIN U.S. JURISDICTION TO UNITED STATES CITIZEN- PARENTS [PEDIGREE] and PROVEN NON-CRIMINAL ALLEGIANCE TO USA [PHILOSOPHY]. For example, SOS Hillary may have the necessary NBC pedigree, but she is a fugitive RICO career racketeer (Uranium One et al); Numbskull Pelosi is next after Pence to be President, but she, too, may have the NBC pedigree but is a pro-foreign operative with proven fake allegiance to the US Constitution; alamaK Harris appears to posses neither NBC pedigree nor NBC philosophy (from sanctuary San Francisco); Santa Clause Sanders may have NBC pedigree but appears to be a devout communist philosopher. This overall wordy summary is the opinion of a natural born U.S. Citizen, based upon what I have learned from many more knowledgable commenters than I, plus from informative websites. Feel free to correct any legal technical statements that I have stated. I thank the editor of this website for the opportunity to express my views. Hopefully, one day justice will be served on the greatest hoax ever perpetrated on the Americans. Prelude: All of the U.S. Senate who were in session in 2008 conspired to influence the 2008 presidential election through an apparently innocuous bill known as Senate Resolution (SR) 511 by referencing a repealed immigration document from the year 1790 to legitimize an otherwise illegitimate John S. McCain, III for the office of the president of the United States and at the same time, used horse blinders to willfully obfuscate and overlook aka Barry HUSSEIN Obama’s own unconstitutional status as a presidential contender for the 2008 presidential election. Background: Before any person of any political party decides that they want to be a candidate for the president of the United States of America, they must have been born in the U.S.A. to two U.S. citizen parents, one female mother and one male father. Hence the term “natural born Citizen” as cited in the U.S. Constitution, Article II, Section 1, Clause 5. Previous attempts to modify the U.S. Constitution, Article II, Section 1, Clause 5 requirement wording from “natural born Citizen’ to simply “born citizen” certainly met with resistance, obfuscation, and confusion. The UniParty realized this change to the U.S. Constitution was unattainable through the Amendment process so they distorted the meaning of natural born Citizen behind the scenes by tickling the electorate with a feather using the ‘technical’ term “natural born Citizen” found in the U.S.A.’s first naturalization law. The SR 511 process was kept low-profile, albeit low-key, and was designed to deceive the public. The actual votes rendered for SR 511 attained 99 Yea votes from the UniParty on this bill. Only U.S. Senator John McCain did not vote for it. His recusal helped with the ‘integrity’ deception. Details: On April 10, 2008, U.S. Senator Claire McCaskill (D) MO, introduced a simple resolution that stated: “S.Res. 511 — 110th Congress: A resolution recognizing that John Sidney McCain, III, is a natural born citizen.” A handful of other U.S. Senators joined-in on the resolution that same day. Those co-sponsors were: Hillary Clinton, [D-NY], Thomas Coburn [R-OK], Patrick Leahy [D-], Barack HUSSEIN Obama [D-IL], and Jim Webb [D-VA]. According to U.S. Senate protocol, SR 511 then went to the “Ordered Reported” status on April 24, 2008 that indicates that the committee has voted to issue a report to the full chamber recommending that the bill be considered further. Only about 1 in 4 bills are reported out of committee. Finally, on April 30, 2008, the SR 511 bill was advanced to the “Agreed To” status where SR 511 resolution was passed in a 99 Yea vote in the U.S. Senate. Audacity: It’s insulting to even fathom that the Democrat Party, in either chamber, would initiate any action item that would politically favor or financially benefit the opposition, as this resolution appeared to be on its face value. What it did do is create a phony bi-partisan endeavor by having select members on both side of the aisle show their support for it, both in the “Introduced” phase and then again in the final “Agreed To” phase with a near-unanimous 99 Yea vote. There had to be a reason why, all of a sudden, the Senate chamber became so cooperative on this issue. This is the UniParty in action. Further Thought: Corporate managers like to hire ‘results-oriented’ individuals. Well, the desired results of this SR 511 were achieved by the UniParty who underhandedly defined the meaning of a natural born citizen as any person who is born in the United States of America without regard to the citizenship of the person’s parents. That’s why they spent the time and energy to focus on McCain’s presidential eligibility – which he isn’t. By focusing on McCain, the implied eligibility was that anyone born in the United States is eligible for the office of the presidency. Otherwise, Barack HUSSEIN Obama’s own eligibility would have been scrutinized with a separate resolution. This behind-the-scenes unwritten definition was instilled into the documentation of the Congressional Research Service. That same “born in the U.S.A.” became a talking point boilerplate canned response for all of the Congressional Members who had to answer their constituents when questioned about Obama’s presidential eligibility. It’s the Law: John S. McCain’s parents were required by law to document and to declare John III a U.S. citizen upon his first entry into continental U.S. If it takes a law to declare someone a U.S. citizen, they are not a natural born (U.S.) Citizen. My nephew, born in England to two U.S. citizen parents (husband USAF enlisted), also needed immigration documentation to declare U.S. citizenship for their son. Summary: People are natural born (U.S.) Citizens by the act of nature (born in the U.S.A. to two U.S. citizen parents), otherwise known as natural law. Congress can only grant statutory (positive laws) U.S. citizenship. Repeated: Only those persons born in the U.S.A. to two U.S. citizen parents are natural born (U.S.) Citizens; all others that do not meet the natural born (U.S.) Citizen specification are statutory citizens and are only eligible for the U.S. Congress or for the U.S. Supreme Court. The authors and signers of SR 511 positively deceived through criminal trickery. Immigration laws are made to proclaim and lawfully make a person a U.S. citizen through positive law. No immigration law can make anyone a natural born Citizen. A natural born Citizen is a U.S. citizen through no laws enacted by Congress. A natural born Citizen is a U.S. Citizen by the law of nature – born on U.S. soil to two U.S. citizen parents. No positive law can do that. It is my opinion that everyone that voted for either McCain or Obama in the 2008 election and again Obama in 2012, voted for an ineligible presidential candidate. Re that list, I compiled that list from a couple sources after doing a search for “congressional attempts to change natural born citizen”. The actual homework was done by others, and I apologize for not giving credit to whom credit is do. of times Congress attempted to alter Natural Born Citizen. I hope the Post & Email will keep this posted for an extended period of time. I ask others to take note of the attempts of Congress to alter NBC and for citizens to contact their Congressmen and Senators on this matter and the link of Obama being an Usurper. January 14, 1975, Rep. Jonathan Bingham [D-NY]: HJR 33 – Constitutional Amendment providing that a citizen of the United States otherwise eligible to hold the Office of President shall not be ineligible because such citizen is not a natural born citizen. January 4, 1977, Rep. Jonathan Bingham [D-NY]: HJR 38 – Constitutional Amendment permitting an otherwise eligible citizen of the United States to hold the office of President even if such individual is not a natural born citizen. June 11, 2003, Rep. Vic Snyder [D-Ark] : HJR 59 – Constitutional Amendment to permit persons who are not natural born citizens of the United States, but who have been citizens of the United States for at least 35 years, to be eligible to hold the offices of president and vice-president. Sept. 3, 2003, Rep. John Conyers [D-MI]: HJR67 – Constitutional Amendment which would have done the same as Snyder’s, only the requirement to be a citizen was lowered to 20 years. Feb. 25, 2004, Sen. Don Nickles [R-OK]: SB 2128 – Natural Born Citizen Act defined natural born citizen as someone who was born in and is subject to the United States. Sept. 15, 2004, Rep. Dana Rohrabacher [R-CA]: HJR 104 – Constitutional Amendment to make eligible for the office of president a person who is not a natural born citizen of the United States but has been a United States citizen for at least 20 years. Jan. 4, 2005, Rep. John Conyers [D-MI]: HJR2 – The same as Rohrabacher’s. Feb. 1, 2005, Rep. Dana Rohrabacher [R-CA]: HJR15 – Constitutional Amendment to require only 20 years citizenship to be eligible for the office of president. April 14, 2005, Rep. Vic Snyder [D-AZ]: HJR42 – Constitutional Amendment making a person who has been a citizen of the United States for at least 35 years and who has been a resident within the United States for at least 14 years eligible to hold the office of President or Vice President. Feb. 28, 2008, Sen. Claire Catskill [D-MO]: SB 2678 – Amendment thereto clarifying that natural-born citizen includes any person born to any U.S. citizen while serving in the active or reserve components of the U.S. armed forces. Eric Otto, The term of art “Natural Born Citizen” has been defined, affirmed and reaffirmed over (6) times by the US Supreme Court. A Natural Born [U.S.] Citizen is “One born IN the United States to parents who are BOTH U.S. Citizens themselves”. NO exceptions. Harris has Jamaican citizenship by Descent. Well it’s interesting that some guy has a brand new definition of “natural born citizen” but the real, accepted definition is…………..BORN IN THE UNITED STATES. There is NO nonsense about being born in the US to two parents that are also citizens of the US. How is this happening in America!!!????????????? Why are these people not vetted, Espically to be President!!!!!!!!!!!! From Black Law Dictionary online: What is NATURAL-BORN? Kamala is an Anchor Baby! Barack Hussein Obama ruined the fabrc of the United States, by design, with his fundamental transformation. He used race as the jihadi weapon to do it and everyone who is a shade ligher than Kamala Harris is considered a racist until proven otherwise. We hear accusations of racism a hundred times a day. I’m convinced that Obama still tells the MSM to continue the racist drumbeat, and find it behind evey rock, sideways glance, greeting, or Wall. If you want a continuation of Obama, then Harris is your ticket. She was bred on “justice.” And carries the same disdain for the United states as Obama, and, and as demonstrated time and again during public hearings, she is is the epiotmy of arrogant Rude, loud, like a pitbull. I don’t care is she was born on the WH steps. She is unfit to be president of THIS nation. Perhaps she should try Canada or Jamaica. Kamala Harris is NOT eligible to be President. She is NOT a “Natural Born Citizen”. Her Mother was an Indian Citizen when Kamala was born. Her Father, a Jamaican citizen. It is happening again. Constitutionally barred IMPOSTERS are encroaching on OUR Presidency. Kamala and Obama can be what ever they want because the Constitution means nothing – it has no standing for us to rely on. The constitution is a dormant doc due to the 1783 Treaty of Peace. Remember, on paper the English won the Revolutionary War and were awarded the spoils of war so the King could pay for his he King’s business venture supported by his English Esquires, and Mason implants known as Ben Franklin, John Jay and Thomas Jefferson. Yes, traitors not hero’s. Come on guys know your American history. How many more crimes do we have to identify past the 1783 Treaty of Peace which actually made all government crimes allowable till this day. That Treaty did not recognize the people as sovereigns, it took away the rights of people to govern themselves, they couldn’t manage their money because King George was made Arch Treasurer of the united States of America. No more God’s Law and Natural Law they got the English Maritime Law and now we called it the BAR. And maybe of real importance is no more Allodial Land Title allowed as real property ownership system where the real property is owned free and clear of any superior landlord. We the People get to pay rent in the form of taxes and fees. No recognized sovereignty you are a citizen debt slave and without any real standing but to receive what the government gives you and can take away. Remedy is to make null and void the Treaty and rewrite it in our favor so we are never to be used as cannon fodder again. Until then SOS differant day. Actually under the legal doctrine of coverture which was commonplace at the time of the drafting of the Constitution and actually persisted into the 20th century, the FATHER’S citizenship was paramount. A foreign citizen wife’s citizenship was subsumed at marriage by the American citizen husband. The married couple were essentially one person in law and both American citizens. A child born to married progenitors (I know it’s a big word) of the aforementioned circumstances would thus be considered a Natural Born Citizen. If a person owes their citizenship to some act of law or statute “(naturalization for example)”, they cannot be considered a natural-born citizen. All Natural Born Citizens are Citizens @Birth…. 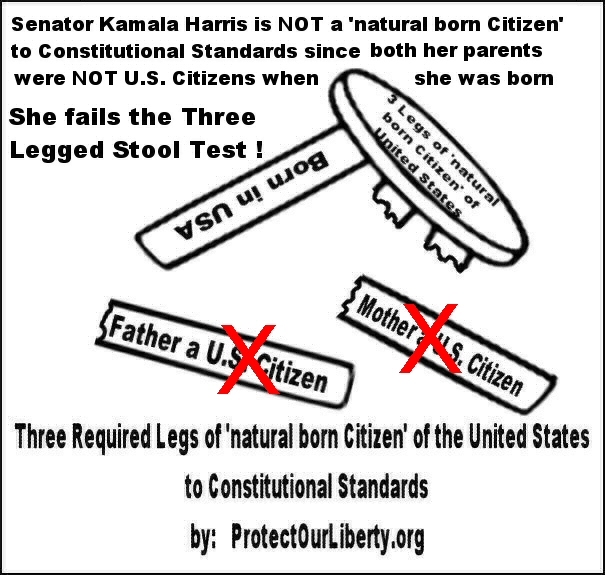 Kamala Harris is NOT a natural born citizen. Her birth in Oakland, CA to non-citizen parents made her ONLY a citizen, not a natural born citizen. Birth on U.S. soil + citizen father + citizen mother = natural born citizen, period! She is not constitutionally eligible for the presidency or vice-presidency! 1. A background investigation using Standard Form (SF) 86 covering their entire lifespan and the results of this SF86 document should be made public to all constituents one year prior to election. 2. A lie detector test should be a mandatory requirement before being added to the ballot. 3. The SF86 results should be used by an independent civilian organization to assess suitability for a minimum Top Secret classified clearance. If a person is rejected for this Top Secret classified clearance, they also should be rejected for the ballot. Here’s a little help and a reminder for a certain previous commenter (hint: it’s not G.M.W.) from Emmerich De Vattel on how to determine who may be a natural born (U.S.) citizen as directed by Article II, Section 1, Clause 5 of the U.S. Constitution as formed by our Founding Fathers who were highly influenced by De Vattel’s teachings. See https://lonang.com/library/reference/vattel-law-of-nations/vatt-119/ for additional information on The Law of Nations or the Principles of Natural Law (1758). Parting shot: Article I candidates do not need to be a natural born (U.S.) citizen, but must otherwise be a U.S. citizen – plain vanilla, if-you-will as dictated by positive law. The People’s say is limited on the Federal level to electing officials who select judges that reflect the People’s philosophy. At the state level, the People have the ability to directly vote for judges who reflect the People’s philosophy. For example in San Diego, Gary Keep was elected as a judge. Kreep worked with Orly Taitz in some of the earliest eligibility lawsuits. Unfortunately his judicial career has not progressed as many might have hoped. MC Duff you’re dreaming if you think the courts and the deep state government give a darn about the people and law and order. The evidence that substantiates my premise is out there for all to see. The courts issue rulings, which are legally binding on the people. If the people think the courts got one wrong, the people (via their representatives or ballot initiatives) can change the law (or amend the constitution), as permitted. The people (again through their representatives or the ballot box) also can remove errant judges via impeachment, recall, not re-electing them, or other procedures as permitted by law. Civil disobedience also is an option for the people. But those who ignore judicial rulings that they don’t agree with should expect the government to punish that disobedience. Who has the final say: the courts or the people? Who actually decides what is a Supreme Court precedent? Who decides how to interpret a Supreme Court opinion? Isn’t it the lower courts? Litigants make an argument that this Supreme Court opinion or that opinion supports their position and the courts (the trier of law) determines which of them is right. Several courts have ruled that Wong Kim Ark is the binding precedent and several have specifically said that Minor v. Happersett is not. So until the Supreme Court steps in and rules the lower courts are wrong, the case law supports Senators Harris, Rubio, Governor Jindal and Ambassador Haley. A greater court can overrule a lower court’s ruling, but until that actually happens, the lower court’s ruling is the law. Which is exactly what happened with Ankeny. Ankeny is the law only in Indiana. But no judge or legal scholar ever has said that Ankeny got it wrong, or that Minor requires two citizen patents. As if the Supreme Court has to specifically rule that one it’s cases trumps a lower court’s case, or that a lower court somehow got it wrong. Lower court judges can reject a Supreme Court ruling until the sun doesn’t shine but their opinion doesn’t trump that Supreme Court ruling. The U.S. Supreme Court has never ruled that Minor “trumps” Ankeny, or that Ankeny somehow got it wrong. And judges have rejected the argument that Minor requires two citizen parents. Look into it and report here what you find. The Ankeny opinion was a published opinion by the Indiana Court of Appeals. The Indiana Supreme Court unanimously refused to hear the appeal. Why is there no raised seal? Why are the typed entries all pixelated? Look at box 12 Birthplace of the Father – NYC is pixelated almost as if it came from a different document that was at a different resoltion than the black background. Could this document be used to obtain a passport? For the WHY the “natural born Citizen” clause, a national security clause, was added to the U.S. Constitution for the eligibility requirements for the singular most power office in our federal government, President and Commander-in-Chief of our military, and its original intent, meaning, and understanding to those who put it in there see this White Paper: https://www.scribd.com/doc/300919680/The-Who-What-When-Where-Why-and-How-of-the-natural-born-Citizen-Term-in-Our-U-S-Constitution Unfortunately the courts are for the most part controlled by the two major political parties on this subject with each of the two parties having their favored non-natural born Citizen candidates and thus far this has not been permitted to get to the U.S. Supreme Court due to lower court technicality rulings such as “standing” and/or by the U.S. Supreme Court dodging cases which did petition them. Ankeny wasn’t a SCOTUS case, but many judges cited it when concluding that Obama was a natural-born citizen. No judge or legal scholar has ever said that Ankeny was wrongly decided. Also too, for completeness, when Trump obtained his birth certificate from New York, it was a short form with no hospital or doctor listed, no signature of his mother, no raised seal and marked void. Tron that would mean that Anwar Al-Awaki, born in New Mexico to Yemeni citizen parents was eligible to run for POTUS. Ridiculous on its face. Under Indiana rules that makes Ankeny binding on all Indiana state courts. So in Indiana the legal definition of a natural born citizen is based on the Ankeny decision. So all anyone needs to do is get a different state court to rule that a natural born citizen requires two citizen parents and the case will have to be taken up by the U.S. Supreme Court. This is the ruling that U.S. courts defer to when ruling on NBC. “Based upon the language of Article II, Section 1, Clause 4 and the guidanceprovided by Wong Kim Ark, we conclude that persons born within the borders of theUnited States are “natural born Citizens” for Article II, Section 1 purposes, regardless of the citizenship of their parents. I would like to infom you that, contrary to your opinion, every American DOES NOT have a constitutionally-guaranteed right to (free) education, public safety and healthcare. I would also like to inform you that, once again contrary to your opinion, every American DOES have a Constitutional INALIENABLE right to keep and bear arms. Thank you for your opinions. If you have any doubts as to which of our opinions is correct please do not hesitate to take me to the Supreme Court of the United States.